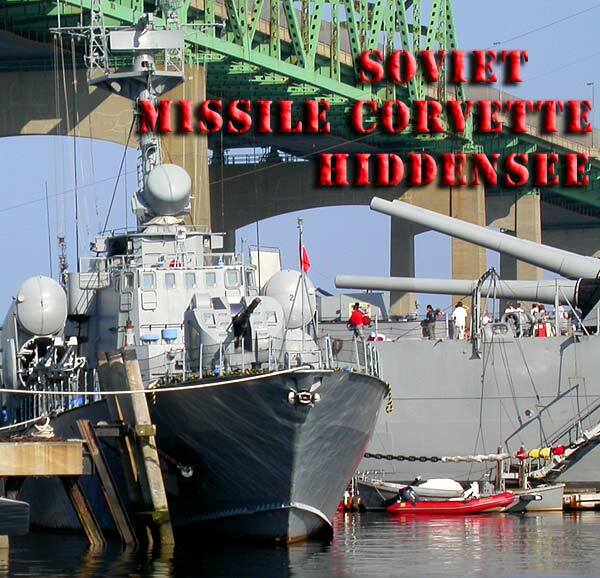 The Soviet Missile Corvette Hiddensee is located at the Battleship Cove Naval Museum in Fall River, MA. Being a Soviet Vessel on display in the US makes the Hiddensee a very unique naval museum vessel as the USSR did not give up its more advanced military equipment to the US as a rule. 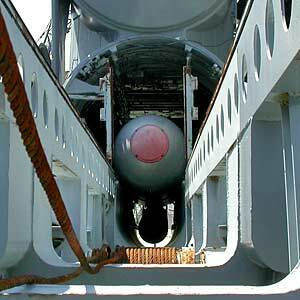 The ship has one 2 STYX KT-38E missile launchers on either side of the superstructure. These missiles are quite big and could easily take out another lightly armored warship. 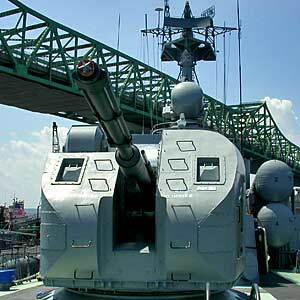 I liked the Dalek shaped AK-630 30mm gatling anti aircraft gun mounts aft. Although the tops look like an armored casting they feel by hand like they are fiberglas and appear to be cracking and delaminating. 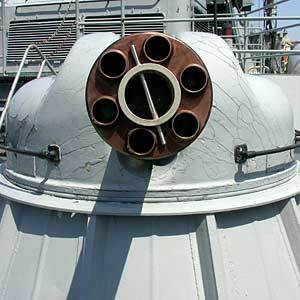 One of the most interesting features of the Soviet Missile Corvette Hiddensee is its 2 stage gas turbine propulsion system. There are 2 low speed turboshaft engines that power the Hiddensee from idle to cruise speed. These gas turbine engines exhaust through the two stacks located on the top of the superstructure, now covered by 2 red caps. When high speed maneuvering is required, the high speed turbines are brought online. These gave the ship a top speed of over 45 knots or about 52mph! When they are started up 2 large hatches on the stern swing open to allow the exhaust from the high speed gas turbines to vent out the stern. The ship was actually used by the US Navy for naval exercises as an aggressor vessel for a few years. It must have run rings around the US ships. Another interesting aspect about this Soviet Missile Corvette were the crew's accommodations. For a naval vessel this ship has a lot of room on board in the crew areas, more so than on US ships where in some cases the crewmen are just about packed one on top of the other. You'll see this when you tour the crew's compartments of the Battleship Massachusetts. The bunks are packed pretty tight. The exterior paint is flaking and rusting in places but the interior is in pretty good shape for the most part. The tour of this Soviet Missile Corvette is self guided and the more interesting compartments are partitioned off with plexiglas. The automatic loading system for the 76mm bow turret is completely enclosed in that plexiglas and it's very challenging to photograph. I would recommend bringing a tripod. If you are planning to visit the Soviet Missile Corvette Hiddensee, be sure to allow yourself a full day as there is a great deal to see at the museum. You can get lunch on site in the snack bar/grill located in the galley of the Battleship USS Massachusetts. The food was decent and was reasonably priced. Moored on the museum's property are the Battleship USS Massachusetts BB-59, the Destroyer USS Joseph P. Kennedy DD-850, the Submarine USS Lionfish SS-298, the Elco PT Boat PT-617, and the Higgins PT Boat PT-796. Bring your camera and good walking shoes and be prepared to do a lot of walking and climbing. It's well worth the trip. January 2010 - Brandy-Hans van PARIJS sent me an interesting link to a Hiddensee Reenactment Group. The The Volksmarine of New England perform reenactments in original East German crew member's uniforms aboard this ship and welcome others who would like to join them. Brandy also reminded me that although the Hiddensee was built in the former Soviet Union, it actually served in the German Democratic Republic People's Navy protecting the East German coastline. 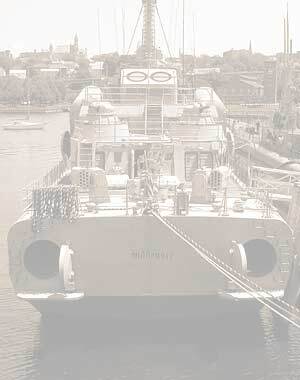 During the Tarantul class corvette's service to the GDR navy it was known as the Rudolf Eglehofer and served the East German navy until the end of the cold war when it was transferred to the German Federal navy, then in 1991 it was transferred to the US navy for study and use in naval wargames as an aggressor vessel.